This apartment is in Palm Springs. Nearby parks include Jackie Lee Houston Plaza, Ruth Hardy Park and Sunrise Park. 430 N. Greenhouse Way has a Walk Score of 36 out of 100. This location is a Car-Dependent neighborhood so most errands require a car. 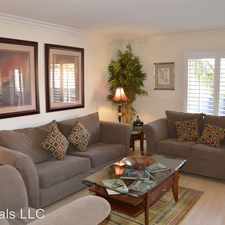 1180 square foot, non-smoking condo, 2 bedrooms, 2 baths, kitchen, dining area, living room, 2 large walk in closets. Private landscaped patio with a southern exposure. Living room has a large off white leather sectional, a pullout couch, a large screen tv, antique furnishings. 2 baths, the hall bath is a tub shower combination and the master bedroom has a standalone shower. Both baths have large vanities. The master bedroom has a California king size bed. The hall bedroom has 2 fastened twin beds. The living room and both bedroom floors are sand colored carpet. The rest of the condo floors are done in off white ceramic tile. Many antique furnishings throughout. Lots of storage and closet space. This condo is on one level and fully equipped, there are only 2 steps up into the patio. 3 Flat screen hdtvs, Fully equipped kitchen: with stove, oven, toaster oven, dishwasher, microwave, refrigerator, linen, towels, silverware, pots and pans, iron and board, dishes and utensils pantry items, coffee maker. In unit washer and dryer. Patio: lounge furniture, gas grill, table and chairs, utility closet, landscaped garden. Off-road Quads, ATVs, Dune Buggies, San Diego and all Southern California beaches all within 2 hour drive. Seasonal Tenant Desired - November 1st to April 30th. 30 day Minimum Lease. Seasonal average high temperatures range from 70 - 88 degrees. Reliable sunshine in Palm Springs, one of the sunniest resort destinations in the USA. Explore how far you can travel by car, bus, bike and foot from 430 N. Greenhouse Way. 430 N. Greenhouse Way has some transit which means a few nearby public transportation options. Car sharing is available from RelayRides. 430 N. Greenhouse Way is in the city of Palm Springs, CA. Palm Springs has an average Walk Score of 35 and has 44,552 residents.